The band’s representative said: “The wedding was beautiful. It was a gorgeous, 70-degree day. 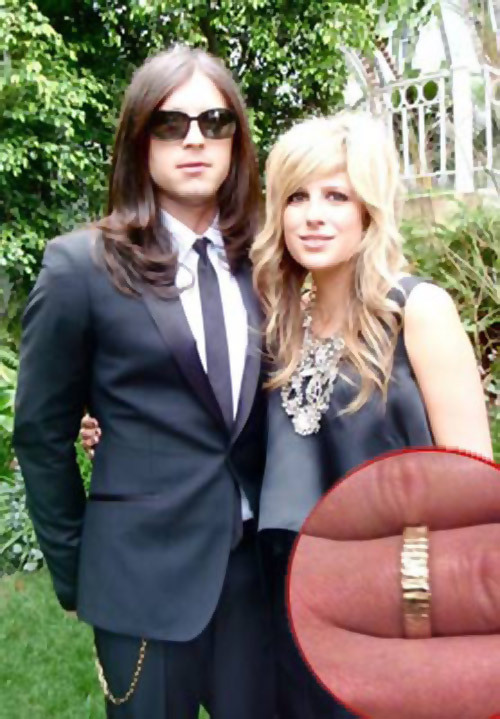 It was a very love-affirming wedding with lots of warmth and happiness.” Nathan Followill was heard saying Saturday morning, “This time tomorrow night I will be wearing some new jewelry. I’m so excited for tomorrow. A new day, a new life, and a new wife. Thanks Jess.”” I wonder if Nathan had known about the Disney engagement rings would he have bought Baylin one? His bandmates — brothers Caleb and Jared Followill and cousin Matthew Followill — attended the wedding in Tennessee on Saturday, November 14, 2009. So did actress Scarlett Johansson, a high school friend of the bride. Followill’s band, Kings of Leon, has skyrocketed in popularity recently (to the dismay of longtime fans…) with the release of their latest album, Only by the Night, late last year. Their long-haired, whiskey-infused mix of pop-rock, blues and southern twang has won over many a listener. < Previous How did these lucky ladies get a free wedding dress? I hope their marriage works out too, heck the average couple has a 50% chance of making it but I’ve always wondered what the stats are on celebrity marriages, I’m sure their higher since their under so much more pressure.